I am a Dublin-based jeweller with a huge grá (love) for creating contemporary jewellery that captures the essence of Ireland and its people’s connection with the sea, earth and Atlantic Ocean surrounding the Emerald Isle. Transforming traditional Celtic symbolism, Irish culture and heritage into distinctive pieces of jewellery is at the heart of my creations. I made a radical life change following a successful career as an actuary. Having commissioned a necklace for a family friend, I followed my heart and embarked on a career as a jewellery designer that embodies my free spirit and love of my Irish heritage. I was born in Dublin city centre and was educated through the Irish language, so I love speaking Irish. I have always been inspired by the rich artistic and mythological history of Ireland. 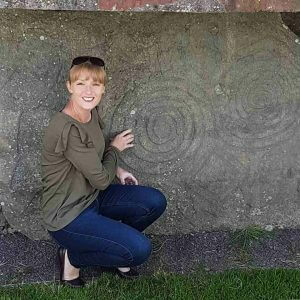 Sites like Newgrange, Loughcrew, Tara directly influence my jewellery designs. As a child, I was (and must admit still am!) in awe of how Newgrange allowed the light to shine through its chambers on the winter solstice to spectacular effect. Through combining precious metals with translucent materials, I attempt to recreate the magic of Newgrange to allow the light to shine through my pieces to reveal Celtic spirals (triskele). This can be seen in my Growing Home and Children of Lir coloured collections. I have an emotional connection with Irish folklore and am inspired to create collections that tell a story. Each collection has a meaning that resonates with the wearer. A story card explaining the meaning behind the design comes with each piece. My work is currently available in Ireland and the US through selected stores and is now available in the British Museum. Each piece is meticulously crafted in Ireland with love of Irish roots, history and folklore. Each piece is meticulously crafted in Ireland with love for Irish roots, history and folklore. I particularly enjoy exploring and re-imagining existing Celtic symbolism to create pieces that have a special meaning attaching to them. It’s important that I create special pieces that resonate with the wearer. I have a simple test when I work on a piece to determine whether it will become part of my collection. Once I’ve finished working on it at the bench, I place it in my left hand and close. If my heart quickens when I open my hand because the piece excites me, I continue to develop it. My first design, the Celtic Trinity Heart pendant, was made for somebody very special and while it is a simple retake of the Celtic Trinity knot, its meaning is very strong. The addition of the heart in the middle of the traditional knot symbolises “Forever love” & has been received by many for a variety of reasons. Tracy’s Growing Home collection is a re-imagined “Tree of Life” with Ireland represented as a tree – rotate the pieces to see the strong tree image become a map of Ireland. Like most trees, it has weathered many storms but continues to grow strong – it is deeply rooted. It also has the parallel meaning of having roots firmly planted in Ireland and that Ireland continues to grow and provides shelter to her people no matter where they are living. The meaning attaching to my designs is important and a small booklet explaining the meaning comes with each piece. ​I am also a proud member of the North Atlantic Celtic Traders Association.